Students will design and build advanced propulsion solutions that are based on categories from the California Air Resources Board (CARB) zero emissions vehicle (ZEV) regulations. Students are encouraged to explore a variety of solutions including electric, hybrid, plug-in hybrid and fuel cells. In addition, they will incorporate lightweight materials, improve aerodynamics and utilize alternative fuels such as ethanol, hydrogen and biodiesel. Using a real-world engineering process modeled after GM’s Global Vehicle Development Process (GVDP), teams will integrate their advanced technology solutions into a vehicle donated by GM. The GVDP is the modeling simulation process currently used to develop all GM vehicles. This real-world approach gives students valuable hands-on experience in engineering practices and resource allocation. The EcoCAR competition is unique for its focus on modeling and simulation, as well as subsystem development and testing, rather than just hardware modifications. 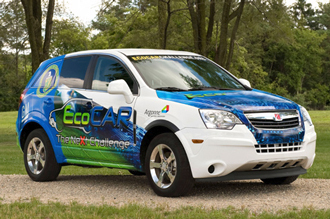 EcoCAR: The NeXt Challenge was established by the United States Department of Energy (DOE) and General Motors (GM) and is being managed by Argonne National Laboratory. More information is available at www.ecocarchallenge.org and on the competition blog at www.green-garage.org. In the first year of EcoCAR, student teams received $10,000 in seed money to begin developing their vehicle designs. Year One was an essential foundation for establishing a successful vehicle by emphasizing the use of math-based design tools—like Argonne’s Powertrain Systems Analysis Toolkit (PSAT) or similar vehicle models—and the development of software-in-the-loop (SIL) and hardware-in-the-loop (HIL) simulation techniques. The student teams researched, compared and selected advanced technologies that met the competition and team goals, and used hardware simulation techniques to develop and test their powertrains and subsystems. Students explored a variety of solutions including, Extended Range Electric Vehicles (EREV), Full Function Electric Vehicle (FFEV), Fuel Cell Plug-in Hybrid Electric Vehicles (FC PHEV), and Plug-In Hybrid Electric Vehicles (PHEV), and each team created a unique design. Extended Range Electric Vehicles (EREV) - Eight of the EcoCARteams, including Embry Riddle Aeronautical University, Mississippi State University, North Carolina State University, Ohio State University, Pennsylvania State University, University of Wisconsin, University of Victoria and Virginia Tech chose to design Extended Range Electric Vehicles, which demonstrate full performance with an electric powertrain for all electric driving and an optimized combustion engine that can extend the range of the vehicle with its on-board fuel storage. The EcoCARteams that selected an EREV as their architecture will use either B20 or E85 to extend the range of their electric vehicles. B20 is a blend of 20% biodiesel and 80% petroleum diesel and E85 is a blend of 85% ethanol and 15% gasoline. Plug-In Hybrid Electric Vehicles (PHEV) - Five of the sixteen EcoCAR teams, including Georgia Tech, Michigan Tech University, Rose-Hulman Institute of Technology, Texas Tech, and West Virginia University, designed Plug-In Hybrid Electric Vehicles which are constructed with a large lithium ion battery. The battery can be recharged by plugging into the wall and the vehicle may operate without using the engine at all. Once the plug-in range of the battery is depleted the vehicle can still operate as a regular hybrid. The architectures will use either B20 or E85 to extend the range of the vehicles. Full Function Electric Vehicle (FFEV) - Only one team, University of Ontario Institute of Technology (UOIT) chose to design a Full Function Electric Vehicle, which has an all-electric motor powering its drive train and has over 100 miles of range. It stores energy in batteries that can be charged using a home electrical outlet. Fuel Cell Plug-in Hybrid Electric Vehicles (FC PHEV) - Two of the sixteen EcoCAR teams, including University of Waterloo and Missouri University of Science and Technology, designed a Fuel Cell Plug-in Hybrid Vehicle which uses an onboard hydrogen fuel cell to either propel the vehicle or recharge a battery pack. The battery pack can be charged using a home electrical outlet. The FC PHEV uses significant battery energy before relying on the fuel cell to extend the range of the vehicle. All of the vehicles have plug-in capability, which can significantly reduce on-road petroleum consumption. All of the designs use state-of-the-art lithium ion battery technology, so the vehicles are able to store more electric energy in smaller, lighter packages. All of the vehicles use a renewable energy source that displaces petroleum consumption, which significantly reduces the amount of greenhouse gases emitted from the vehicle’s tailpipes. All of the EcoCARteam architectures must retain the safety and real-world performance characteristics of production vehicles that consumers demand. By broadening the technical focus of the competition to include more aspects of the entire vehicle development process, the university teams had a greater opportunity to expand their learning and refine their vehicle solutions. Ohio State University placed first in Year One of the competition and the University of Victoria and Mississippi State took home second and third place honors. All teams successfully completed the first year of EcoCAR and earned a vehicle key and the opportunity to compete in the second phase of the program. During the second and third years of the competition, students build the physical vehicle and continue to refine, test, and improve vehicle operation. After receiving their physical vehicle, each team begins building the core components of their cars, as parts come in. A few months prior to the Year Two Finals, teams face critical Safety & Inspection Testing, which takes place on their respective campus. After passing early inspections, the re-engineered student vehicle prototypes will compete in a week-long Finals competition of engineering tests. These tests are similar to the tests GM conducts to determine a prototype’s readiness for production and the Year Two testing will take place at GM’s Desert Proving Grounds in Yuma, Arizona, a facility used for commercial vehicles. The Greenhouse gas, Regulated Emissions, and Energy in Transportation (GREET) model, developed at Argonne National Laboratory, will be used to assess a well-to-wheel analysis of the greenhouse gas impacts of the technology each team selects. After the successful completion of Year Two, students will spend Year Three refining and improving their vehicles and will face a similar cycle of tests and competitions throughout the year. In Spring 2011, the Year Three winning team and overall EcoCAR competition winner will be announced. The U.S. Department of Energy and General Motors are the headline sponsors for the EcoCAR competition. General Motors will provide production vehicles, vehicle components, seed money, technical mentoring and operational support. The U.S. Department of Energy and its research and development facility, Argonne National Laboratory, will provide competition management, team evaluation and technical and logistical support. By sponsoring advanced vehicle engineering competitions like EcoCAR, GM, the Department of Energy and other industry sponsors are helping to develop the next generation of scientists and engineers. EcoCARfollows the previous successful student engineering competition, “Challenge X: Crossover to Sustainable Mobility,” also sponsored by GM and the U.S. Department of Energy.